Labor Day is almost here in Big Bear Lake and summer is coming to an end. Join us as we finish off the summer season with fun activities and cool, mountain weather. Here are all the details. See you soon! 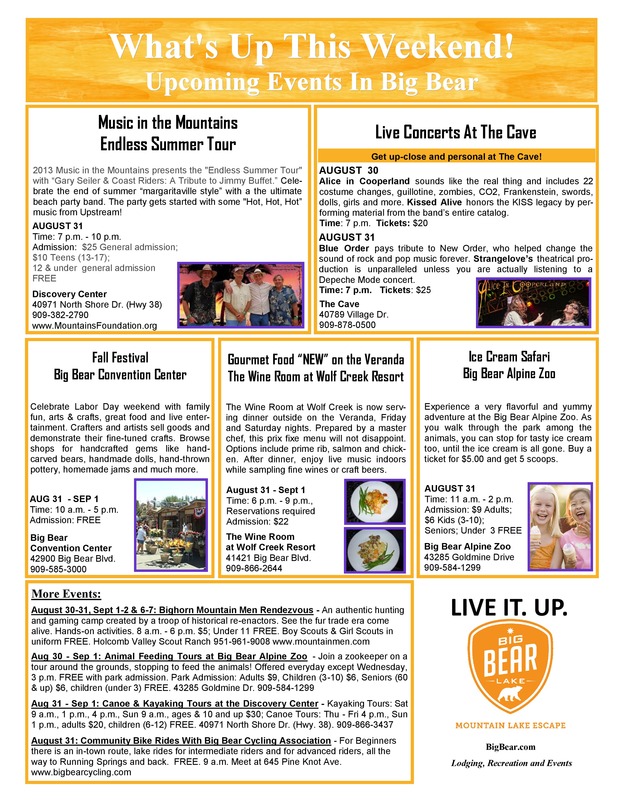 Summer is winding down in Beautiful Big Bear Lake, but there is still a little time to enjoy all of the hot, summer activities we have going on! Squeeze in one last getaway weekend before fall begins and get a sizzling deal while you’re at it! and only pay for 2. That’s right! Get one night FREE this Labor Day Weekend! Visit us today at RSVacations.net and find your perfect cabin before they’re all gone! We have cabins available for every group and budget. Don’t miss out on this end of summer deal! I love homemade things. Food, decor, quilts, gifts….somehow stuff is just better when it comes from the heart, you know? Knowing that someone spent their own precious time and energy to create something just to make me happy – it just gives me the warm fuzzies! Giving homemade is giving a piece of yourself. I have received a couple of handmade gifts over the years that are absolutely precious to me. The first is a ‘double wedding ring’ quilt that my Grandmother made for myself and my husband for our wedding. She used my favorite color for the back and used several of her old blouses ans dresses cut up for the pieces. Every time I snuggle up in it, I can remember her and feel her warm arms around me. She was the best! The second is a set of gifts that I will also treasure forever. My Mother-in-Law (whom I absolutely adored and miss terribly! 😦 ) was always crafting. It was her passion. 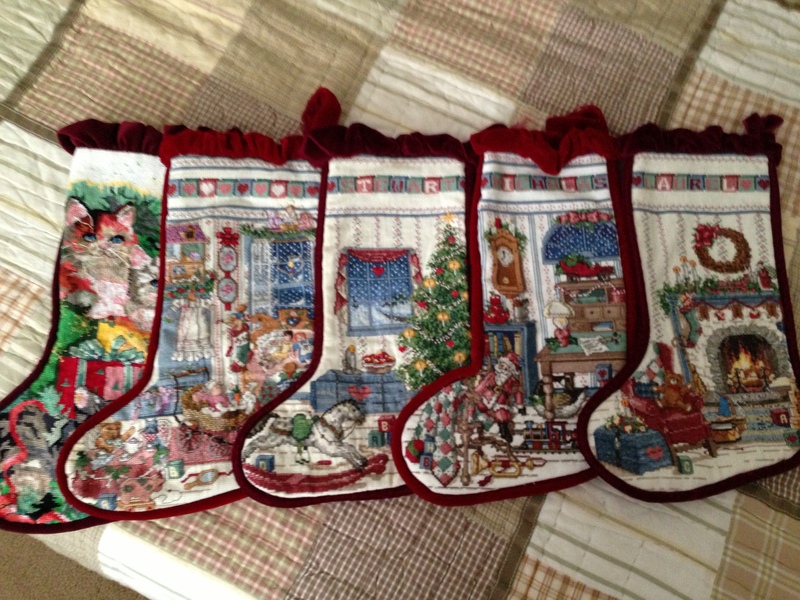 For a time she loved to do cross-stitch and one year I opened up her gift and beheld a set of Christmas stockings for our family. I can’t even imagine the hundreds of hours she must have spent on them. She made an extra one for a future daughter-in-law and even one for our cat. It is one of the greatest gifts I have ever received. I miss you Mom!! Time is a precious commodity that most of us don’t have enough of and trying to make handmade gifts is truly not possible for some people. The next best thing to making something yourself is to buy something that was made by hand. It still required time and care to create and has a uniqueness that makes it special. On Labor Day weekend here in Big Bear Lake, the annual Fall Fest – Arts and Crafts Fair will be going on at the Convention Center. Here you will find a treasure trove of handmade gifts that you can browse and purchase – for yourself and as gifts. Come find that one-of-a-kind something that someone you love will adore! Join us as we welcome Fall and get your holiday shopping started. See you soon! Savor the breathtaking lake and Stanfield Marsh views from every room in this 3500 sq ft. elegant yet comfortable tri-level mountain home just made for a family or friend reunion. Relish every amenity that is provided for your enjoyment; from the game room with its pool table, game table, wet bar and wood fireplace to the spacious outdoor spa. Your group will fall in love with heavenly Eden Mountain Lodge. The front door opens to a spacious great room with a floor to ceiling fireplace surrounded by comfy seating. The roomy gourmet kitchen with double oven and space for plenty of cooks has bar seating that opens up to the dining and living areas. The romantic first floor master suite has a king size bed and a master bath with jetted tub and gas fireplace. Sliders lead out to the spa with gorgeous views from one of five decks. The second floor has a Game Room to die for with pool table, wet bar and seating around another wood fireplace. The room has THREE flat screens. Just around the corner you will find another cozy master with a king size bed and jettedi tub. The two other welcoming bedrooms open out to a shared deck. One room has a king and the other a queen and twin over double bunk. Two queen sleep sofas ( one in the great room and one in the game room) and twin futon (in the loft area) make everyone comfy. WiFi, Surround Sound, an Intercom system, DVD player and a full size washer and dryer are provided for your convenience. Fido can join his pack here. Good Pets Welcome! Relax, unwind, and enjoy as you make wonderful Big Bear memories! Shopping Close ByGood Dogs Welcome. Woof! View more photos, check availability and book Eden Mountain Lodge online at RSVacations.net today and treat yourself to a relaxing Big Bear Lake Vacation. *Thank you for allowing us to stay in your gorgeous home. We felt so cozy, warm, luxurious and elegant all in one. *What a lovely time we had. This is the 4th year our group has come to Big Bear and I must say this cabin is the top of the charts. 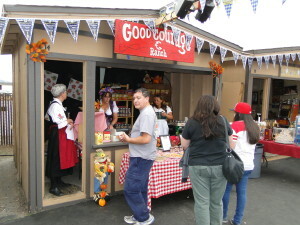 *Family from Tustin totally enjoyed ourselves… Your home felt like our home away from home. All the comforts of home. Thanks for the cozy and personal touches. We plan on visiting again. *Kenny was absolutely amazing and super responsive!…The stay was extremely enjoyable and the cabin was amazing… We would definitely book this cabin again! Thank you again for all your help in making it so enjoyable. *Awesome place. Love the balconies, the pool table, the kitchen island and fireplaces. There are just a couple more weeks of ‘official’ summertime fun here in Big Bear Lake. It looks like our typical, late-summer afternoon thunderstorms will be showing themselves this coming week. That is a great thing! Not only do we need the moisture, but the thunder, lightning and hail make for a spectacular show – not to mention the smell in the mountains after it rains! Wonderful!! There is a lot going on as well. 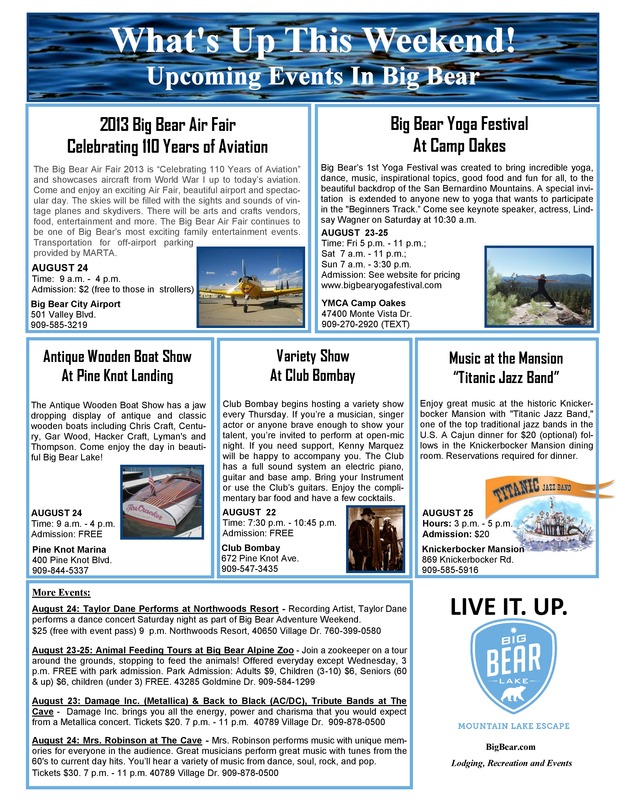 Take part in the excitement of the annual Air Show at the Big Bear Airport, find your zen at the Yoga Festival, Rock out with 90’s superstar Taylor Dayne, check out some amazing wooden boats and so much more! Have I mentioned that we have some super-hot deals going on right now? Book a Big Bear Cabin at RSVacations.net and get 35% off the 2nd night of a 2 night stay OR stay for 3 nights and pay for 2. We also have extra savings on selected homes. Check out all of our specials and packages here. See you soon!